We are an organization that is dedicated to the enjoyment of building and flying model aircraft. 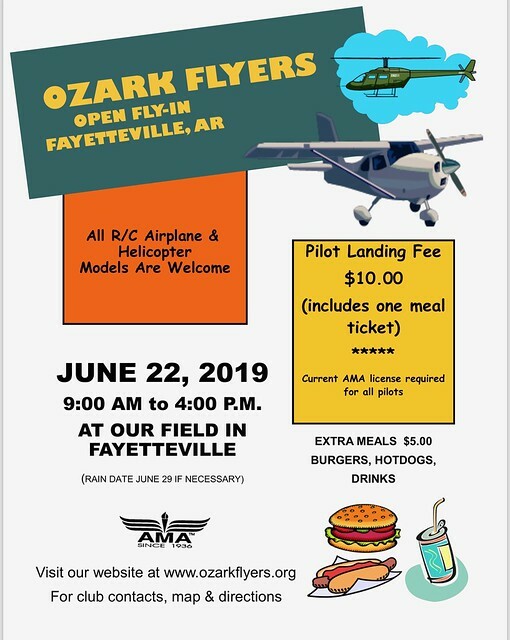 While we promote model aviation, we teach and encourage our pilots and spectators to safely enjoy the hobby. Our flying facility is Chanault Field. It is maintained by the club and located in Fayetteville, Arkansas on property that is owned and provided for our use by the Park and Recreation division of the city of Fayetteville. We are an Academy of Model Aeronautics chartered club and adhere to all rules and regulations of that organization. All aircraft are flown and welcome at our field. we have members that actively fly electric airplanes, electric helicopters, glow-powered airplanes, glow-powered helicopters and giant scale gasoline airplanes.